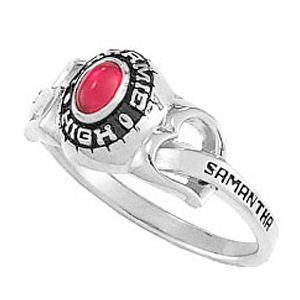 The girls' siladium Heartstrings class ring offers two side engraving areas. Choose stone color and engravings. This high school class ring is handcrafted by ArtCarved. Siladium is fine jeweler's stainless steel. Ring top width: 9.0mm, palm width: 2.0mm. Enjoy ArtCarved's limited lifetime warranty. Import. There are no extra fees if you choose a school from our list. Alternatively, you may choose custom wording around the stone for $99.00 extra. Choose a state and a menu of available high schools in that state will appear below. The graduation year is engraved on the LEFT side of the ring. Backdates are available for an additional $20. The first name is engraved on the RIGHT side of the ring. My dtr is very pleased with this ring! We went through another company online and were very disappointed in the engraving and quality, and returned the ring when it arrived. The description and picture of the ring from Joy Jewelers is exactly what arrived in the mail. It even arrived sooner than estimated. Thank you!